Major General Robert Ross was an Irish officer in the British Army. He gained much experience during the Napoleonic Wars, serving under the famous Duke of Wellington, who was England’s top military commander. Ross was characterized by his taste for discipline, courage, and energy. Unlike other officers, he was not given to directing from the rear, but preferred to share the dangers of war alongside his men. 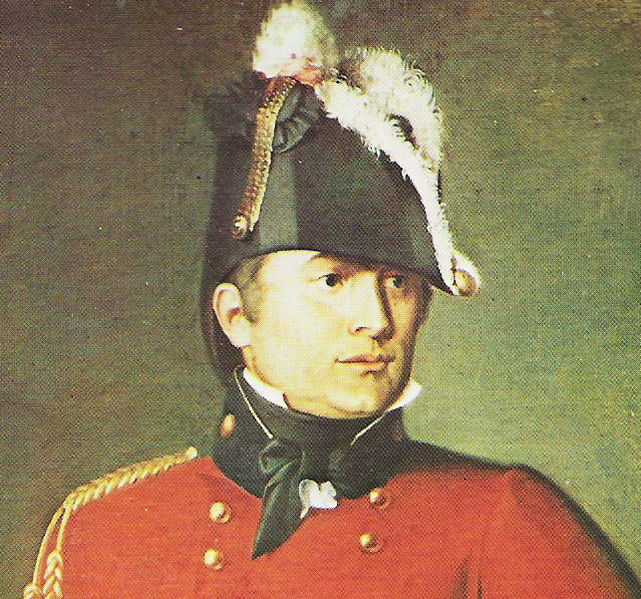 Ross was selected to command the land forces being sent to Vice Admiral Cochrane in his effort to bring the War of 1812 to American soil. Ross’ main objectives were to capture any American military stores and destroy American harbors and their shipping. Additionally, Ross was to attack the coast of the United States to distract the Americans from attacking British territory in Canada. Ross set sail from Bermuda heading for the Chesapeake Bay with 4,000 troops. He was very cautious in choosing his targets, as his numbers and supplies were low. They landed at Benedict on the Patuxent on August 19, 1814, meeting no opposition from the Americans. The following morning the British marched towards Washington, first through Nottingham and continuing through Upper Marlborough. They purposefully chose not to take the most direct route to hide their intentions. As Ross continued, American forces purposefully avoided attack, believing they were outnumbered, although they unknowingly had the advantage. 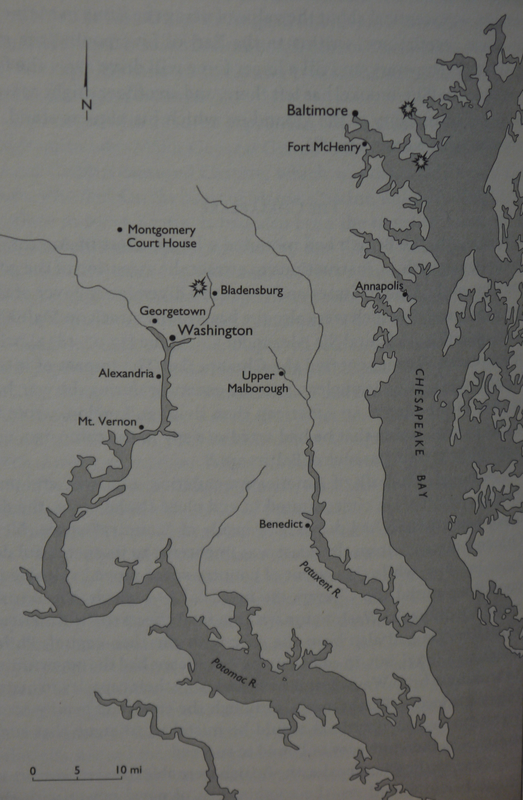 In Bladensburg, the British finally met American resistance on August 24. Ross was able to engage and defeat them in separate actions, outflanking the American riflemen and separating the troops of multiple commanders. The Americans were disorganized and unprepared, being largely comprised of militia who did not train regularly. Even during the battle, lines of soldiers began to flee. It was a decisive British victory, bolstering their motivation and opening their path to the capital. That night, the British entered Washington. The American government was highly unprepared as they were convinced that Washington had no strategic value and would not be attacked. Ross preferred to ransom Washington, but finding no one, he began to burn the White House, Capital, and other public buildings. While Ross hoped to induce America to agree to peace, the destruction would instead bring more Americans to support the war and further inspire those fighting to defeat the British. The Americans were now aware of British intent and resolve, and they bolstered defenses around Baltimore which prevented British victory there. The night after he burned Washington, Ross began his retreat. Along with his fellow commanders, he planned to next strike Baltimore, and on September 11, Ross sailed up the Patapsco, landing at North Point. American riflemen were sent in defense, opening fire on Ross and his men. The commander heard firing and, in his typical fashion, galloped forward to determine the size of the American forces, when he was struck mortally in the chest. The news of Ross’ death spread and stunned his men, destroying their moral and lifting American spirits in time for the battle at Baltimore. Beirne, Francis F., and Fontaine Dorothy. The War of 1812. New York: E.P. Dutton, 1949. Print. Black, Jeremy. 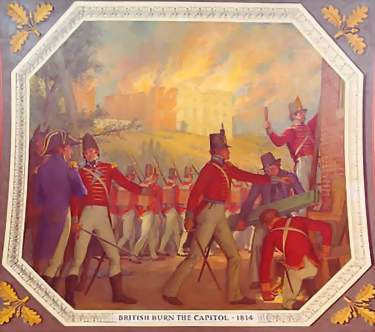 The War of 1812 in the Age of Napoleon. Norman: University of Oklahoma Press, 2009. Coles, Harry Lewis. The War of 1812. Chicago: University of Chicago, 1965. Print. Eshelman, Ralph E., Scott S. Sheads, and Donald R. Hickey. The War of 1812 in the Chesapeake: A Reference Guide to Historic Sites in Maryland, Virginia, and the District of Columbia. Baltimore, MD: Johns Hopkins UP, 2010. Print. Forester, C. S. The Age of Fighting Sail: The Story of the Naval War of 1812. Doubleday, 1956. Print. “General Robert Ross.” The Man Who Captured Washington. http://www.themanwhocapturedwashington.com/ (accessed April 16, 2012). Lloyd, Alan. The Scorching of Washington. Washington: Robert B. Luce, 1974. Print. Shomette, Donald. Flotilla: The Patuxent Naval Campaign in the War of 1812. Baltimore: Johns Hopkins UP, 2009. Print. “The War of 1812 Images.” US Coast Guard Home. http://www.uscg.mil/ (accessed April 16, 2012).